The Dark Triad of Personality: Narcissism, Machiavellianism, and Psychopathy in Everyday Life summarizes the latest research on how these personality traits (psychopathology, narcissism, Machiavellianism) are defined and displayed, while also exploring the impact they have on individuals and society, the relationship between clinical conditions and personality traits, and their adaptivity. 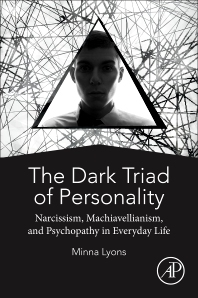 The book introduces the Dark Triad through the lens of existing clinical and personality literature, discussing shared and unique cognitive and empathetic profiles associated with each trait. Antisocial, antagonistic, and criminal behaviors associated with the Dark Triad are also covered, as is the way these individuals compete socially and in the workplace. Dr. Lyons main research interests are individual differences from an evolutionary perspective. She uses the Life History theory as a framework in investigating individual differences in altruism, social intelligence, morality, attachment, and the Dark Triad of personality. She is the co-author of the book Biological Psychology, and has authored or co-authored over 50 papers in journals such as Personality and Individual Differences; Evolution and Human Behavior; and Current Psychology.